A collaboration between BATTERY and Norfolk Southern research groups. This project was sponsored by Norfolk Southern and the Federal Railroad Administration. Follow the links below for access to the publication. 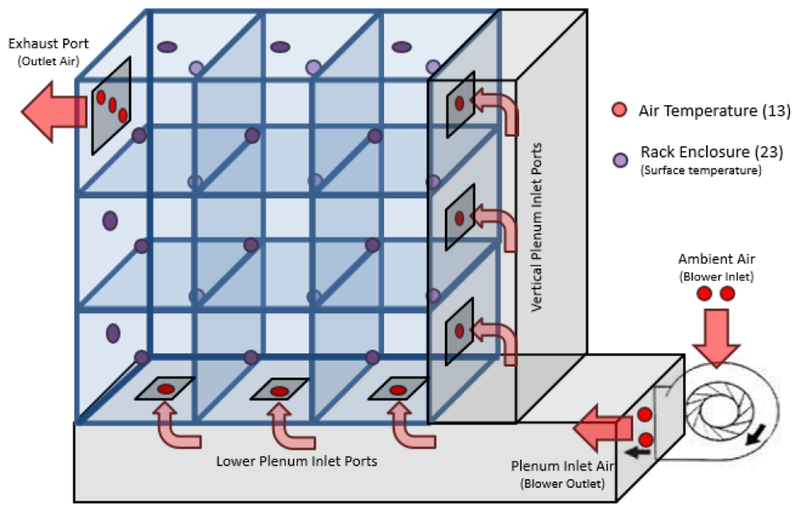 Computational fluid dynamic studies were used to support scaling of the full cooling system as only one of 16 strings were used in this work. .
Often, available power from an in-vehicle energy storage system is governed by thermal limitations. Modeling of battery pack thermal response is crucial to managing its cooling system energy consumption and estimating available charge/discharge power for future locomotive tractive and regenerative effort. Active cooling through forced air flow was simulated using computer-aided design of the battery pack and its enclosure. Module scaled (series string of 54 12V batteries) testing and modeling of both air flow and temperature distribution was performed and validated for sealed lead acid carbon batteries. A controller area network and data logger collected temperature data from 218 sensors placed throughout a battery pack module during electrical loading for both switcher and over-the-road cycles while under various environmental thermal loadings. A blower on-off control algorithm was optimized to minimize energy consumption and implemented based on temperature array statistics.